Below are some of the more basic types of jewellery pliers. This is not a comprehensive range (yet!) ... as there is a huge variety of basic & specialty jewellery-beading pliers out there. But this will give you a good overview of the most popular and versatile of the jewellers pliers available. Flat nose pliers, Snipe nose pliers, and the Chain nose pliers all taper towards a flat end. They are handy in working with wire and when attaching findings like french crimps or calottes. It is better to have pliers that have smooth inner jaws as the serrated ones could damage your wire and work. Whether you choose the spring-loaded on non-spring-loaded pliers is a matter of personal choice. The jaws of the jewellery pliers can be serrated or smooth. Smooth jaws ensures that your work will not be nicked or marked by the pliers. Serrated jaws will give you a much firmer girp. Most pliers either have box joints or lap joints. Box joints are normally longer-lasting. Jewellers often prefer the Bent Nose Pliers to the Straight Pliers because, with the bent jaw, it allows them to keep their wrists comfortably straight while working. The bent nose of the pliers allows them to get to more difficult small areas easily. Normally the thinner the jaw tip, the better for very fine, detailed work. These pliers do not taper towards their ends. They are especially useful for attaching leather crimps or spring end to thongs. Chain Pliers are the most traditional & popular of pliers. The inside jaws of these could be smooth or serrated. They are used for making bends, loops, etc. These pliers are truly useful when finishing necklaces or bracelets with French crimps. Cutter or Nippers are for cutting a variety of metal. The shape & angle of the cutting edge will determine how the cut-end of the wire will look like. Flat Nose Pliers are also designed for making angular bends. 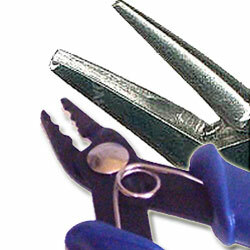 Wire cutters are important when you are working with wire and specialised beading threads. Memory cutters are essential when you are working with memory wire as the memory wire cutters are heavy-duty and designed for dealing with the strong wires. Round Nose Pliers have smooth circular tapered jaws that are designed so as to not nick or mar the materials they are working with. Round nose pliers are ideal for making loops, circles, and coils from wire or sheet metal. If you work with wire, you will need round-nose pliers. Get a good pair with neat, short "nose" as this will better allow you to make small, neat loops while maintaining good control of your work. These specialised pliers will truly save your fingers and hours of hard fiddly work when you use a lot of splitrings. Apart from these fabulous jewellery pliers, there are many other handy jewllers tools to help you gain even more master in the art of jewelry making.